A little over a month ago I received Mary Kay's Clear Proof Acne Care System compliments of Influenster. For those of you who aren't familiar with Influenster it is a community for social media lovers to share news, products, and reviews (for more information head over to influenster.com). Luckily I was eligible to receive Mary Kay's Clear Proof Acne System. It retails for $45, however Mary Kay does offer trial sizes for those of you who are not a fan of the steep price or who just want to give the system a test run. My usual skin routine consisted solely of me using a facial cleanser and a facial moisturizer so I was more than willing to try something new. After using the system I have concluded that it is effective. 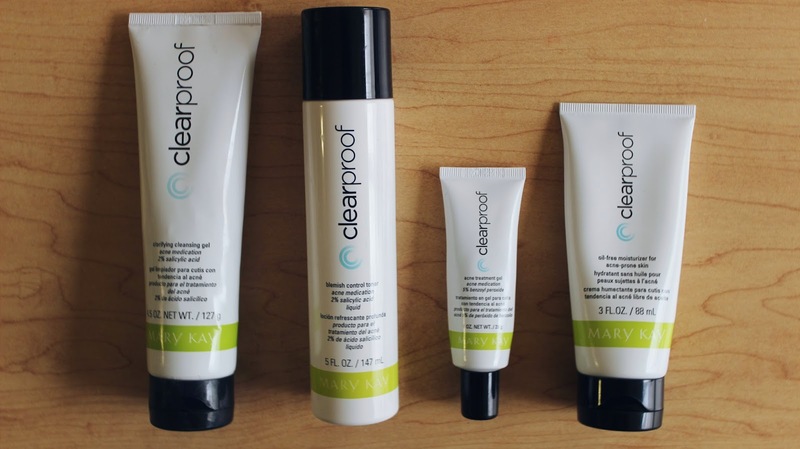 Does the kit clear up all of my acne? No. But does my skin look significantly different? Definitely. This stuff is everything. With a little water the gel transforms into a very rich lather. As with most facial cleansers, the face wash will leave your face dry. For this reason it is very important to immediately follow the next steps unless you are into that dry ashy feeling on your face. This was my very first time adding a toner into my skincare regimen. Upon washing my face with the cleansing gel I put the toner onto a cotton ball and applied it all over my face. The toner is used to cleanse the skin completely and help control excess shine. This too left my face a bit dry but the toner thoroughly cleanses the skin which left my face feeling completely clean. With my acne prone skin this gel was heaven sent. It helps clear new pimples while preventing new ones while also clearing old dark scars. While this is not the best acne clearing spot treatment I have ever used, I can definitely say that it works. This is the final step. This is honestly one of the best facial moisturizers I have ever used. While most facial moisturizers often leave the skin oily and shiny looking this one does the complete opposite and a little bit goes a long way. It gives the skin a clean smooth feeling. Out of all the products in the system this is what I will most likely be repurchasing. Overall I would give the system an 8 out of 10. For those with moderate acne this system will make a huge difference.. After using it consistently I saw results in as little as a week. The only con that I found about the system is that after using a combination of all the products I found that my face would often have a very oily residue which caused my face (particularly my t-zone) to look very shiny. I used E.L.F Essential Shine Eraser Sheets to elimnate this shine. Other than that I would highly recommend the use of these products. With consistency results will be seen. The system can be purchased here.